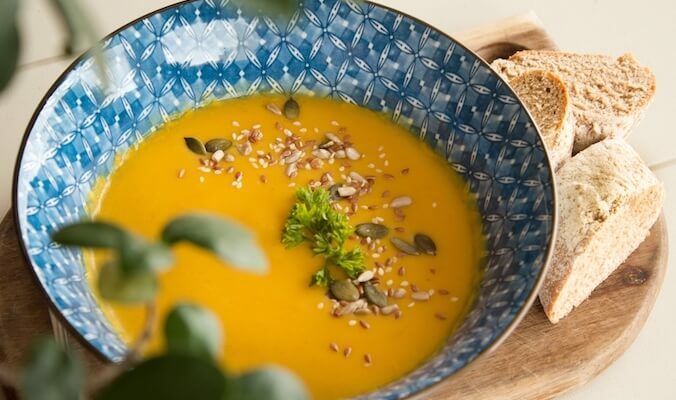 Perfect for the cold season: this Ayurvedic carrot ginger soup is not only nurturing for your soul but can also be adjusted to your individual Dosha type. Add the healthy fat (oil or Ghee) and the mustard seeds to a pot or pan over medium high heat until the seeds pop. Stir in the other spices and the vegetables, sauté for 2 minutes, then reduce the heat to medium. Add the dried apricots and sauté for another 1 to 2 minutes. Add all the liquids and simmer for 15 to 20 minutes. Season and garnish to taste and and enjoy your heart warming carrot ginger soup! Add more oil and liquids to the dish. Cook with the Vata spice mixture. Prepare with lots of ginger. Use more earthy and sweet vegetables and only small amounts of raw or bitter vegetables. Do not use chili and season gently with just a little pepper. Cook with the Pitta spice mixture and garnish with fresh coriander. Use mainly alkaline vegetables and avoid acidity. Eat small portions. Cook with the Kapha spice mixture and season with cayenne pepper or chili. Use lots of cabbage, lots of greens, light, bitter and astringent vegetables. Go easy on the oil and serve with only light sauces.